Tara Hill: (Sacred 'Heart' of Island). 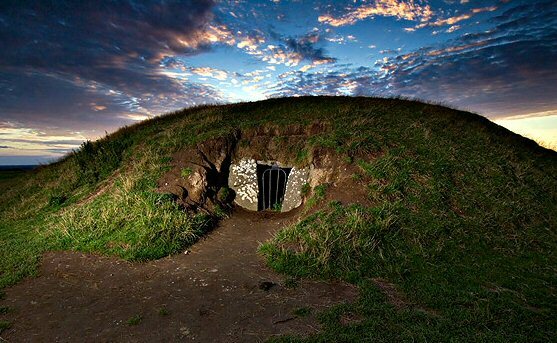 The Hill of Tara, known as Temair in Gaelic, was once the ancient seat of power in Ireland – 142 kings are said to have reigned there in prehistoric and historic times. In ancient Irish religion and mythology Temair was the sacred place of dwelling for the gods, and was the entrance to the otherworld. 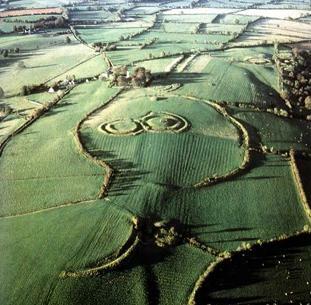 Saint Patrick is said to have come to Tara to confront the ancient religion of the pagans at its most powerful site. Tara Hill is currently in the news because of the controversial development of the M3 bypass which is literally cutting the ancient landscape in half..
Tara Hill: ('Teamhair na Rí', "Hill of the Kings"). Tara Hill was one of the most venerated religious spots in early Ireland and the seat of the High Kings of Ireland from the 3rd century until 1022 AD. 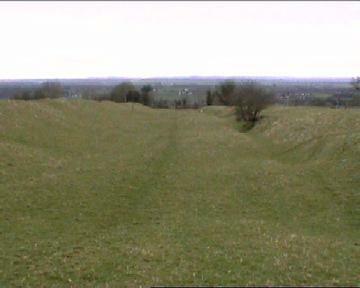 Despite its importance, and compared to other prehistoric Irish sites, at Tara there are no signs of regal past, nor impressive remains, only the remains of earthworks. In fact, this small cluster of megaliths represents a single component of an extended prehistoric landscape which would have provided the ability to recognising specific moments of the lunar and solar cycles throughout the year. In the case of Tara, the chamber of the 'Mound of hostages' is aligned to mark the November 8th and February 4th, quarter days (along with Dowth and Cairns L and U at Loughcrew). Tara is only 10 miles distant from The Boyne Valley complex, which is clearly visible from there. The landscape around Tara Hill is currently (2008) being desecrated through the shameful and unimaginative development of the M3 Motorway extension which is being driven through the Tara valley, destroying numerous prehistoric sites in the process, and denying future generations to the chance to make a more informed decision. The development of the M3 Motorway through the Tara-valley has led to its entry into the World Monuments Fund's 2008 Watch List of the 100 Most Endangered Sites in the world. The 'Mound of the Hostages' - The most prominent and oldest monument on the hill is the Mound of the Hostages, upon which stands the 'Stone of destiny' (below). The Mound of Hostages dates back to the Neolithic period and is contemporary with the Boyne Valley structures (1). Tara Hill was one of the most venerated religious spots in early Ireland and the seat of the High Kings of Ireland from the 3rd century until 1022. Despite its importance, the expectant visitor may be disappointed in what he sees as, at Tara there are no signs of regal past, nor impressive remains, only the remains of earthworks. But this cluster of megaliths represents a part a larger system capable of recognising specific parts of the lunar and solar cycles. 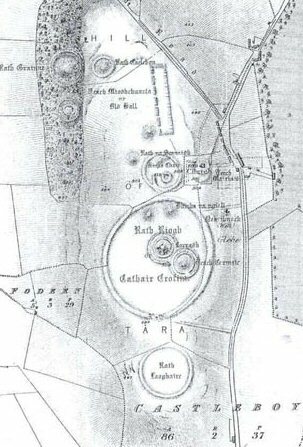 In the case of Tara, it the chamber of the Mound of hostages' is aligned to mark the November, February quarter days, along with Dowth and Cairns L and U at Loughcrew. Tara is only 10 miles distant from The Boyne Valley, which is clearly visible from there. The passage, 4m in length and 1m wide, was subdivided by sill-stones into three compartments each containing cremated remains. The engraved stone inside the mound of Hostages has been likened to a map of Tara hill itself. There is a similarity between the layout of the bank and ditch constructions and rock-art from the same period. The Stone of destiny - Originally stood on top of the Mound of Hostages. The Hill of Tara in the Royal County of Meath was for centuries in ancient times the seat of the High King of Ireland, the Ard Ri. This monolith is called the Lia Fial, The Stone of Fal or the Stone of Destiny. The tradition is that the High Kings of Ireland would be crowned here, and that the Stone would roar or cry out loudly if touched by the true High King. Some believe that the original Stone of Fal was taken to England and placed under the Coronation Throne in Westminster Abbey, then in the current Century stolen, taken into safe keeping in Scotland. Who now knows which is the true Lia Fial or where it lies! 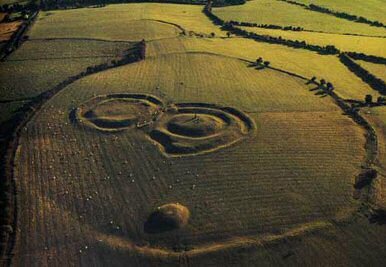 On the Hill of Tara there are the remains of many other earthworks. To the South of the Mound of the Hostages, inside the bank and the ditch of the so-called Royal Enclosure, stand two linked ring-forts known as the Royal Seat and the Forradh. The Forradh has two banks and two ditches around it. 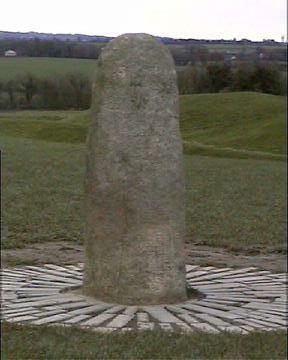 In its centre lies the Lia Fáil, the Stone of Destiny, the most obvious phallic symbol of ancient Ireland. It once stood near the Mound of the Hostages, and it is said to be the stone of the coronation of the kings of Ireland. It roared three times when the future king stood on it. Other legends say it was the pillow of Jacob or the coronation Stone of Scone of Westminster Abbey. To the south of the Royal Enclosure are the remains of another circular earthwork known as the Fort of King Laoghaire, where the king is said to be buried fully armed and in an upright position in order to see his enemies coming. To the north of the Royal Enclosure there are other round earthworks, two of them known as Sloping Trenches and one Gráinne's Fort, named for King Cormac's daughter who was the heroine of the tragic love tale of Diarmuid and Gráinne. Rath Maeve Henge - Half a mile to the South of Tara Hill there is a henge called Rath Maeve (after the legendary goddess-queen Maeve or Medbh). It is about 230m (750ft) in diameter, part of its bank and ditch is well preserved near the road. The Gabhra (Tara-Skreen) Valley is currently in the process of being desecrated by the construction of the M3 motorway, which passes straight through the heart of one of Irelands most sacred prehistoric landscapes; Destroying over 100 prehistoric sites on the process. The Lismullen henge (Partially shaded in blue area in the photo above). It is only recently that archaeologists are beginning to view individual sites in terms of their place in the overall prehistoric landscape. 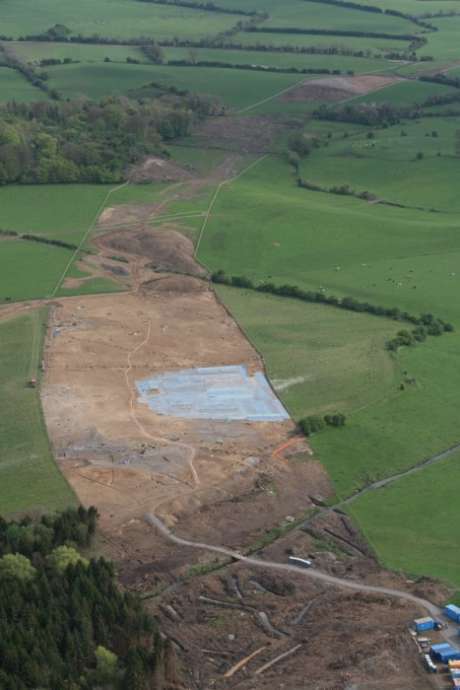 Opponents of the M3 have called on the European Parliament and the European Commission to intervene by asking the Irish government to review its plans and conduct an independent investigation into the highway’s impact on the Tara landscape. Campaigners first approached the commission for help in June 2005. The commission subsequently determined that the road construction violated EU law governing environmental impact assessments; however, it has yet to actually submit a case before the European Court of Justice, and that delay has allowed the Irish government and the Roads Authority to continue construction. On April 2, 2008, campaigners came before the EU Parliament’s petitions committee to resolve the problem. An EU Commission spokesman said the commission would be submitting an application to the court in the coming months; however, he said the commission did not have the authority to halt construction in the interim, as road opponents had hoped. Those who are expert in this area and in the area of Tara are of no doubt that this ritual site, really a temple, is part of the extended Tara complex. It is about 500metres from the area of Rath Lugh also flagged as being under threat of the motorway. This is the place about which there was such a furore in January. The NRA is trying to fit the road between these monuments – this was shown in photographs in the past. This point in the Gabhra Valley is the entrance to Tara. It was more or less expected that a henge would be found in this location. 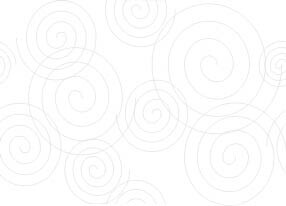 They are usually associated with Passage Tombs. Conor Newman and Joe Fenwick recorded the existence of a straight line of Passage Tombs running from the river Boyne southwards right through the Gabhra Valley and up to the top of the hill. The Mound of the Hostages is surrounded by a henge also, this is 200metres in diameter and is much larger than the Lismullin Henge that is 80metres, still a very large area. These two henges are about the same distance apart as Knowth and Dowth are from each other. No one would doubt that the latter two are related to each other. It is no accident that this henge is exactly where it is. Learn more about the issue and keep abreast of new developments by visiting the websites for the Save Tara campaign and TaraWatch. You can sign an online petition addressed to Irish Prime Minister Bertie Ahern, and join the network of Tara activists through MySpace and Facebook. You can also get involved with the New York-based World Monument Fund, which is working to protect Tara and other endangered sites. 1) E Breathnach. Tara. 1995, Govt of Ireland.